SILMODEL. Cute Lucy and Ethel images features them in their self-designed high fashion dresses. Subtle I Love Lucy logos printed on the background behind their pictures. Images have nice resolution. Red "I Love Lucy" heart logo at lower left. Printed on pre-shrunk, 100% cotton, adult size black tee. Only size XL left in stock. 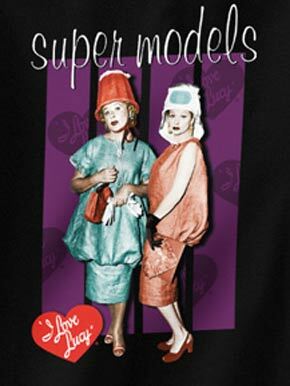 Cute Lucy and Ethel images features them in their self-designed "high fashion" dresses. Subtle "I Love Lucy" logos printed on the background behind their pictures. Images have nice resolution. Red "I Love Lucy" heart logo at lower left.